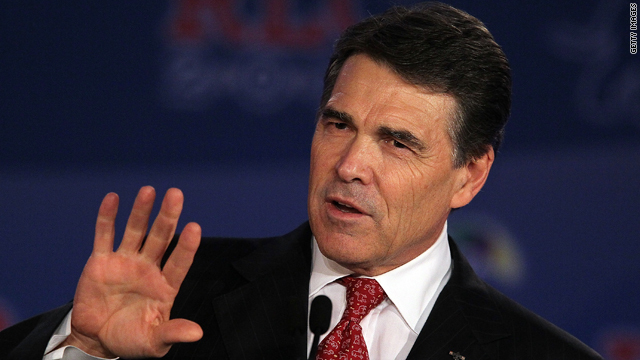 Is it time for Rick Perry to withdraw from the presidential race? Not since Sarah Palin sat down with Katie Couric has a candidate for the nation's highest office looked as bad as Rick Perry did Wednesday night. "I will tell you, it is three agencies of government when I get there that are gone. Commerce, Education, and the - what's the third one there? Let's see. OK. Commerce, Education, and the ... "
When pressed by the moderator, Perry admitted it wasn't the EPA. "The third agency of government I would – I would do away with Education, the Commerce, and, let's see. I can't. The third one, I can't. Sorry. Oops." Right after that debate on CNBC, Perry rushed to the spin room where he tried to make light of what he had done. "I'm glad I had my boots on tonight. I really stepped in it." Note to Mr. Perry: It's time to go away now. This wasn't the first time you came off as an intellectual lightweight in these debates. This "aw shucks," grade – school stuff may play in Texas - but I, sir, don't want you anywhere near the nuclear launch codes. We have a world on the brink of economic collapse and a Middle East on the brink of another war. There is trouble all around, and you lay claim to being able to run the country with what amounts to half a loaf. The saying is, "Half a loaf is better than none." In Rick Perry's case, that's not true. Please just go away. 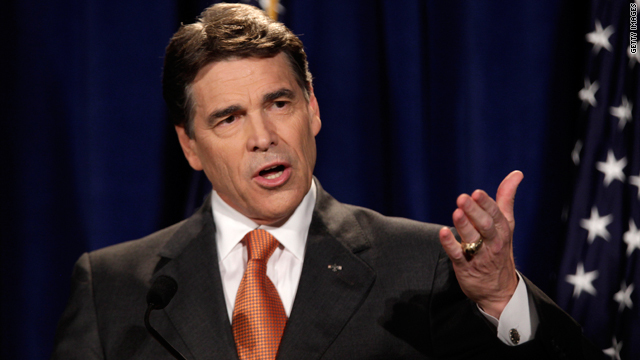 Here’s my question to you: Is it time for Rick Perry to withdraw from the presidential race? What's at stake for Rick Perry in tonight's debate? One of the best lines of the campaign so far is: Rick Perry "went from frontrunner to roadkill in a matter of weeks." Credit the Daily Beast and a fine article titled "What's wrong with Rick." The article examines the Texas governor's spectacular rise - and fall - in the Republican race for president... and how he still might pull off a comeback. Headed into tonight's debate, Perry is a distant third in the race. 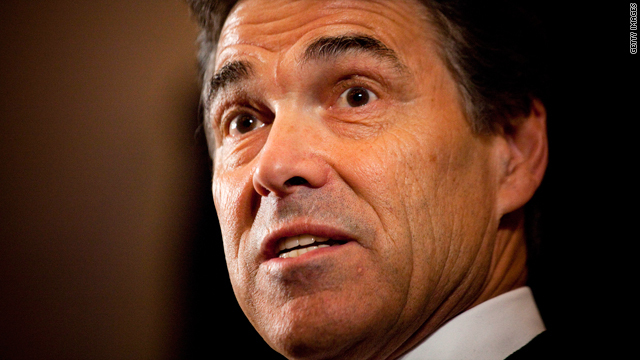 Our new poll shows Perry at 13% - that's down from 30% and the front-runner position just last month. Both Mitt Romney and Herman Cain now have a double-digit lead over Perry. So what happened? Well, for starters, the debates happened. Although Perry is a gifted politician who can work a room or get a crowd excited, he just hasn't been able to hack it during the debates against his more able competitors. Perry also comes under fire for his positions on Social Security and illegal immigration. Plus, as Perry has stumbled through debate performances, his message of job creation in Texas has been lost. In fact, Perry was practically ignored in last week's debate as most of the focus went to Cain's 9-9-9 tax plan. But even if Rick Perry seems like a real long shot right now - this is still presidential politics, it's still early, and a lot can happen. For one thing, Perry has raised a boatload of money: $17 million in just the first 7 weeks of his campaign. And in the game that is presidential politics - money talks. Then there's this: two-thirds of Republicans say they still may change their minds when it comes to which candidate they'll back. The Daily Beast column suggests what perry most needs is to return to the street campaigning that he does best. But he also can't keep showing up at these debates and getting his head handed to him. He gets another shot tonight. 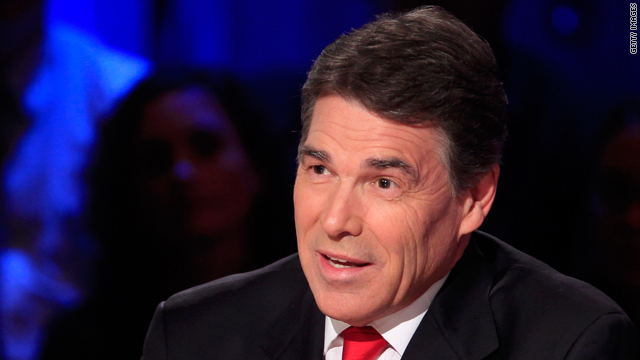 Here’s my question to you: What’s at stake for Rick Perry in tonight’s debate? Are Rick Perry's 15 minutes up? Turns out Rick Perry may be all hat and no cattle. Opponents lobbed the same criticism at another Texas governor and pretend cowboy, George W. Bush. Watching Perry's most recent debate performance, it looked like he got his cowboy boot stuck in his mouth. The Texas governor may be fading out of the Republican race as quickly as he shot to the top of the polls last month. The signs of trouble are stacking up everywhere around Perry, starting with Mitt Romney closing the gap in the national polls. Although Perry is still at the top of the pack, Romney polls stronger against President Obama. 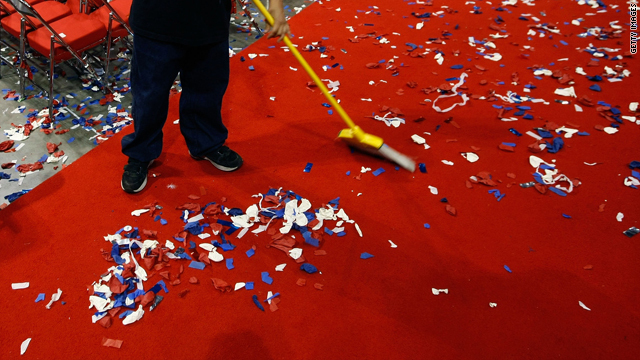 In Florida, businessman Herman Cain pulled a surprise landslide victory. Cain's 37% win topped Perry and Romney combined. Perry was expected to win the Florida straw poll at the start of the weekend, but his underwhelming debate performance put him a distant second. In Michigan's straw poll, Perry also finished second, this time to Romney, a native of Michigan. And last week, Perry placed a distant second to Ron Paul in a California straw poll. These straw polls are only mock elections and don't necessarily reflect how the primaries will go. But, if you are the Republican front-runner, there is an expectation that you win some of them. An adviser to Jon Huntsman's campaign suggests it is becoming increasingly clear Perry can't perform, saying he has a case of "electile dysfunction." Perry's people claim the Florida straw poll is a big loss for Mitt Romney, who has been in the campaign for much longer. 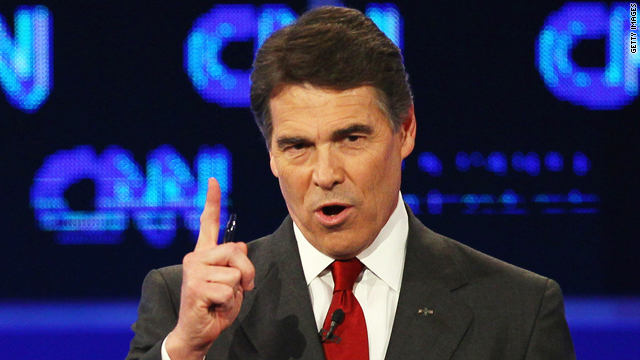 Here’s my question to you: Are Rick Perry's 15 minutes up? Rick Perry says he can't be bought for 5K. How much will this haunt him? If Rick Perry wants to be president - he needs to start thinking more about what he says before he says it. The Texas governor has already come under lots of criticism for saying Federal Reserve chairman Ben Bernanke's actions are potentially treasonous, and for comparing Social Security to a Ponzi scheme. At Monday night's debate, he stepped in it again... and this time it may be harder to scrape off the bottom of his shoe. When Michele Bachmann suggested Perry pushed for the HPV vaccine at the bidding of Pharma giant Merck, Perry reponded, "If you're saying that I can be bought for $5,000, I'm offended." Here's the problem: Perry didn't finish that sentence... he didn't go on to say that he can't be bought at all. and with voters extremely skeptical of the ties between politicians and big business... this is a comment that could haunt Perry for months to come. Meanwhile, Perry claimed he received $5,000 from Merck, but that only represented their 2006 contributions. In all, Perry pocketed about $30,000 from Merck, the maker of the HPV vaccine. Merck has also reportedly given more than 3$380,000 to the Republican governors association, or RGA, since 2006... the year that Perry stepped up his role in that group. One watchdog group estimates the RGA has given Perry's campaigns more than $4 million over the last five years. A Perry spokesman insists the governor's vaccine decision was based only on women's health concerns, saying "What drove the governor on this issue was protecting life and nothing else." It's also worth noting that Perry's ties to Merck don't end with a check - his former chief of staff was a lobbyist for Merck before and after he worked for Perry. Open the window. You can smell this. Here’s my question to you: Rick Perry says he can't be bought for $5,000. How much will this comment haunt him? Is Rick Perry right to call Social Security a Ponzi scheme? Rick Perry went there. The Texas governor has electrified the third rail of American politics by wading into a debate on Social Security. Unless you've been hiding under a rock, you know Perry has referred to the program as a "Ponzi scheme," "a monstrous lie," and a failure. Social Security is perhaps the federal government's most popular program. Millions and millions of Americans rely on it as they reach retirement age. By calling it a Ponzi scheme, Perry is implying that the American people are being duped by a massive fraud. And those are fighting words - which is probably why Perry is walking back his comments a bit. In Monday night's debate, Perry said it's time to have a legitimate conversation about how to fix the federal program so it's not bankrupt. And in an op-ed he wrote Monday, there was no mention of a Ponzi scheme. Here are the facts: Social Security is broken. The program will keep paying out 100% of benefits promised until about 2036. After that, if nothing is done, it would only be able to pay out three-quarters of benefits. What's more, there were only 1.75 full-time private sector workers last year for each person receiving Social Security benefits. Perry suggests a way to fix the program might be to raise the retirement age, or introduce a "means test" to limit payments to the rich. In the past, he's also advocated the privatization of Social Security. Meanwhile, the other Republican candidates, especially Mitt Romney, sense a weakness here and are pouncing on Perry over the Social Security issue. Romney calls Perry's language "over the top." And it seems that most Americans agree. A new CNN/ORC poll shows only 27% think Social Security is a lie and a failure. However, an overwhelming majority believes that changes are needed. Does Rick Perry's lavish lifestyle match his country boy image? Rick Perry would have us believe he's a country boy at heart, a down-home cowboy who can relate to the plight of ordinary Americans. But there's another side to the Texas governor. Politico reports that for years, Perry – who makes $150,000 a year as governor – has enjoyed additional lavish perks and travel, mostly funded by wealthy supporters. Texas donors have paid for the governor and his family to travel around the world, sometimes on private jets; stay in luxury hotels and resorts; vacation in Colorado ski towns; and attend tons of sporting events and concerts. Perry has also accepted a wide range of expensive gifts over the years, including 22 pairs of cowboy boots, some costing more than $500 a pop. Somebody even pays his cable TV bill. Also, the taxpayers are paying the rent, at $8,500 a month, for Perry's 4,600-square-foot Austin mansion. The governor and his family have been living in the five-bedroom, seven-bath mansion since 2007 while the governor's mansion undergoes repair. Four years? What kind of repairs are those? But it's all copacetic in the Lone Star State, which has some of the loosest ethics and campaign rules in the country. Nonetheless, it's hard to imagine that supporters aren't buying influence when they lavish all these perks on the governor. Some donors have wound up with appointments to state commissions or million-dollar state grants to businesses they're involved in. Perry's camp insists that this is all on the up and up. A spokeswoman tells Politico that the governor fully discloses all gifts and travel in his financial disclosure statements. 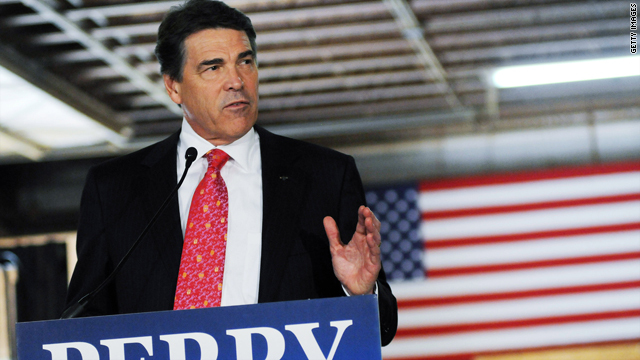 Why is Rick Perry suddenly the darling of the Republican field? 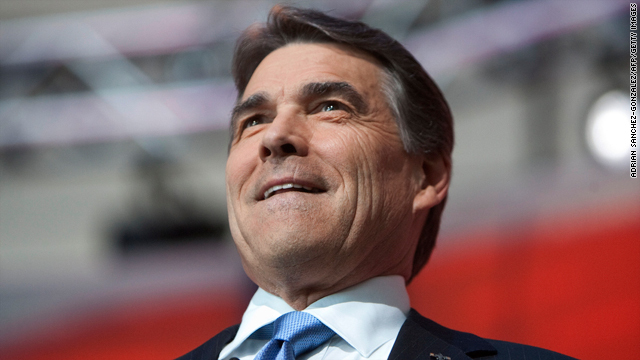 The Republican Party has apparently found itself a new messiah in Rick Perry. The conservative Christian governor of Texas has come out of nowhere and has already lapped the Republican field for President. In the two short weeks since he's entered the race, Perry has shot to the top of the polls and leads his nearest competitor by double digits. The latest CNN/ORC International Poll shows 27% of Republicans supporting him, followed by Mitt Romney at 14%, Sarah Palin – who's not a candidate – at 10%, and Michele Bachmann and Rudy Giuliani – also not a candidate – at 9%. Newt Gingrich and Ron Paul come in at 6%. Perry's supporters tend to be older, white and rich, and his strongest backing comes from tea party supporters. He holds a whopping 23-point lead over Michele Bachmann among tea party members in one CNN poll. It's an astonishing impact in so short a time, especially when Perry has managed to jump to the top of the pack without laying out a single plan or idea for solving America's problems. Instead, Perry has spent the past two weeks making several dumb comments – while, in the proud tradition of President George W. Bush, pretending he's a cowboy. Meanwhile, these poll numbers must have Romney's people tearing their hair out. Romney supporters are urging him to kick up his campaign a notch before it's too late. Which is likely why Romney has changed his schedule this weekend so he can attend two separate tea party events in New Hampshire and South Carolina. And, as Politico reports, "Perry panic" has also fired up the left... something even President Obama has been unable to do recently. Liberals are terrified at the thought of a President Perry when it comes to his stance on issues like women's rights, gun control, the death penalty and the separation of church and state. 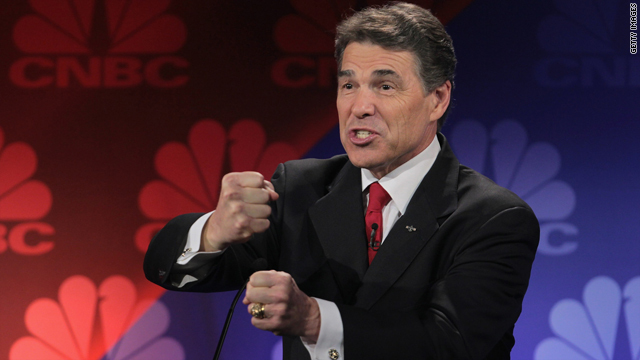 Here’s my question to you: Why is Rick Perry suddenly the darling of the Republican field? How would you compare Rick Perry to George W. Bush? It's hard not to compare Rick Perry to the last Republican governor from Texas who made it all the way to the White House: George W. Bush. Both men are conservative and religious... and neither is what you would call a scholar. But as Texan author James Moore writes on CNN.com, "If Perry and bush had been born in the same family, W would have become known as "the smart one." Bush went to Yale - Perry to Texas A&M. He got Cs and Ds at a place Paul Begala calls "this cute remedial school we have in Texas." Oh yeah, and both were cheerleaders at school. How weird is that? Very. Both were in the service... Bush in the Air National Guard and Perry in the Air Force. When Bush got out of the guard under a cloud of suspicion that he failed to fulfill his entire obligation, he went on to fail in the Texas oil business before becoming a multi-millionaire off the Texas Rangers. Perry headed straight from the military to the family cotton farm and stayed there for seven years before entering Congress. Since being elected to that job, he hasn't made a dime in the private sector. His checks have all come from the government. By the way, neither one of these men are cowboys, but they like to pretend... like little boys who put on cowboy hats and boots and stomp around like they're on the set of the TV show "Bonanza." Differences? As Governor, Bush was known for reaching across the aisle, whereas Perry was the opposite. Also, Bush pushed ideas and policies he didn't necessarily believe in but were politically expedient... Perry on the other hand believes what he's selling and has been described as looking on compromise "as a kind of terminal cancer." Lastly - seems like there's not much love lost between the Bush and Perry camps - The Daily Beast reports that Karl Rove and his operatives appear to have launched a campaign to derail Perry's bid for the White House. 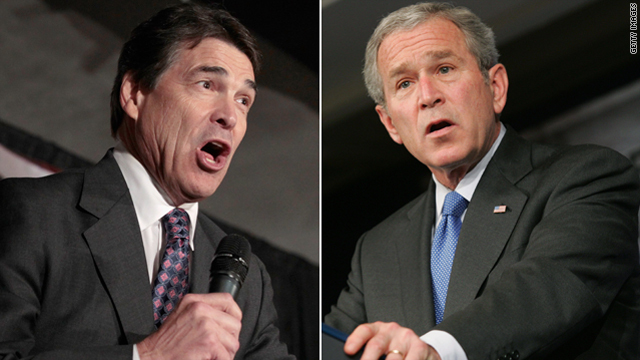 Here’s my question to you: How would you compare Rick Perry to George W. Bush?